Rally d'Italia takes place in Sardinia, based at Alghero for service and HQ. Dusty, hot, part rough, part smooth but always fast. Round 7 of the World Rally Championship with 21 special stages, 310 ss kms and a power stage of Sassari-Argentiera. Wervik is a great event not too far into Belgium. Beer, sun, rally! The event takes place on Saturday with first car 0830. 59miles on 97% tarmac. 3% is easy gravel. The video is 2017 BRC Champion Keith Cronin. Superbly quick. The Mourne Rally is a very fast closed event and part of the ANICC Rally Championship. It takes place around Newry Northern Ireland. 9 Stages totalling 45 stage miles. First car at 1000hrs. The Abingdon CAR-nival Stages takes place at the old Abingdon airfield outside Oxford. It's a Saturday Sprint and separate Sunday Rally. Both super fast and technical sections are a tough tarmac challenge for the 100 crews. It's a round of the AEMC, ASEMC, ASWMC, Heart of England Championships. 70 competitive miles over 8 stages. First car 0900hrs. Blackpool South Shore MSC run the Weeton Stages at Weeton Barracks/Camp near Blackpool. There are 12 stages covering 50 miles. It's a round of the ANWCC and SD34 Stage Rally Championships. It's a non-spectator venue so get marshalling or grab a spanner. Also called the Heartlands Mini Stages, the event takes place around Portlaoise and has a total stage distance of 90kms. There is a ceremonial start in the town centre on 1930 Sat 9 and first car away 0950hrs Sun 10. The Welsh National Tarmacadam and Welsh Historic Championships move on to MOD Caerwent for a single venue tarmac rally. There are 60 stage miles over 6 stages. First car 0915hrs. The event is non-spectator so try marshalling or helping a team. Run on mostly dirt roads of Cyprus this is a round of the European Rally Championship. Centred in Larnaca. The Donegal International Rally is another great Irish tarmac event running around the tight lanes of Donegal. As a round of the Irish Tarmac Rally Championship you can see the very best Irish drivers and cars. There are 300kms over 20 special stages on this three day event. Again for 2018 it is a round of the British Rally Championship (who knew we'd conquered the Belgians?) and will also have the usual fantastic spread of cars many of which cannot rally in the UK. The entry list will grow to include the best of Brit and Euro rally. The rallying is fast and a great spectacle. British marshal's are always welcome and very well treated. 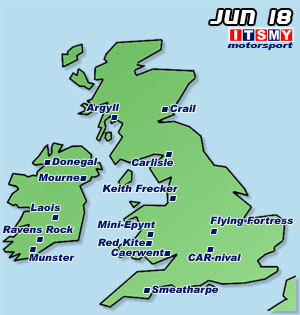 160 stage miles over 20 special stages. Always worth a visit, accommodation is cheap, ferry crossings usually around 40gbp return and only one hour from Dunkerque. It is also a great place to view WWI sites and realise how good your life is. The Ravens Rock Rally runs from Waterford City. Championships involved are Southern 4 and South East Stages. 100 stage kms over 2x3 special stages. First car on Sun is 0800hrs.